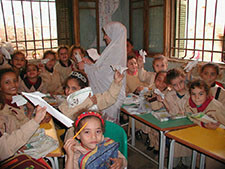 USAID/Egypt has provided nearly $10 million for technology and training to fourteen Egyptian schools. However, Egypt continues to include Islamist religious indoctrination throughout the ostensibly secular Arabic language curriculum. Egypt, with more than 80 million people, is the most populous Arab country and the third largest recipient of U.S. aid after Iraq and Israel. It also purports to be a pillar of moderation—the first Arab country to establish diplomatic relations with Israel. The birthplace of the Muslim Brotherhood, in the 1980s and the 1990s, Egypt also suffered Islamist insurgency, leading many Western officials to believe that their Egyptian counterparts share their concern about the rise of Islamist ideology. A recent study by Adel Guindy published in the Coptic weekly Watani shows that rather than being a pole of opposition to Islamism, the Egyptian government has Islamized its curriculum, perhaps to accommodate Egypt's growing Islamist base, which has hitherto provided some support for the Muslim Brotherhood. Guindy, writing through a prism of rights for Coptic children, demonstrates Islamist religious indoctrination throughout much of the ostensibly secular Arabic language curriculum and provides examples of lessons encouraging students to limit friendship to co-religionists and assigning students to search for hadith (the sayings of and anecdotes about the Prophet Muhammad) and Qur'anic verses. A small sample is provided here. — The Editors. Grade 4: "You and Your Friend—Friendship"
God's Messenger said, "Man's religion is according to his friend's religion. Everybody shall examine with whom he has friendship!" 'Ali ibn Abi-Talib said, "Man is known by his friends." Exercises: 9): Write a noble hadith that shows the importance of friendship on a large panel and post it in your class. Grade 6: "Our Society—Work Proficiency"
A poem by Ahmad Shawqi. Go to the library and look for Qur'anic verses, noble hadiths, or poems that emphasize the value of work; record them to show to your colleagues. The Messenger [Muhammad] said: "God is pleased when someone does something and does it well." Grade 6: "My Health—Obedience to God Is a Duty"
God, may He be exalted, calls upon all people to beware of Satan and to steer clear of his path, for it is the path of evil and corruption, as Satan is an enemy to man and carefully watches and entices him to corruption, with all the means at his disposal. The Most High has said: "O believers, wine and arrow-shuffling, idols and divining-arrows are an abomination, some of Satan's work; so avoid it; haply so you will prosper. Satan only desires to precipitate enmity and hatred between you in regard to wine and arrow-shuffling, and to bar you from the remembrance of God, and from prayer. Will you then desist? And obey God and obey the Messenger, and beware; but if you turn your backs, then know that it is only for Our Messenger to deliver the Message Manifest." Qur'an, 5:90-92. Recite the Qur'anic verses in a correct and expressive way … and to extract what the text means. Satan is the enemy of man. Alcohol and gambling are among the corrupting influences. God forgives whomever He wills all his sins. Obedience to God is mandatory. "O ye who have believed" is a call that shows God's love of the believers. "Obey God and obey the Messenger": an expression denoting the truthfulness of the Messenger and the necessity of obeying his orders. When God prohibits something, it is only because this is for man's good. Go to the computer room in the school and collect Qur'anic verses that denote whatever God, may He be exalted, has made illicit, and post it on the school's bulletin board. "Al-fashiya ad-diniya wa talbanat al-ta'lim al-misri" [Religious fascism and the Talibanization of Egyptian education], Watani (Cairo), Dec. 2007 and Jan. 2008. Translations from Egyptian curriculum are by Adel Guindy. Translation of Qur'anic verses are drawn from A.J. Arberry, ed. The Koran Interpreted: A Translation (New York: Touchstone, 1996). For Sunni Muslims, the fourth caliph (r. 656-61 CE). A famous Egyptian poet (1868-1932). Related Topics: Egypt | Summer 2009 MEQ receive the latest by email: subscribe to the free mef mailing list This text may be reposted or forwarded so long as it is presented as an integral whole with complete and accurate information provided about its author, date, place of publication, and original URL.